Huawei Mate 20 Moniker Trademark Along with Forthcoming Mate Model Numbers - Playfuldroid! Just as Huawei had launched the Mate 10 series in October last year, the Chinese manufacturer is expected to debut the Mate 2 series in October this year. In 2016, Huawei had launched the P9 series and the P10 series were launched last year. Instead of launching using P11 moniker, Huawei had launched its 2018 P-series smartphones as P20 and P20 Pro. Hence, it is speculated that the successor of the Mate 10 will be arriving as Mate 20. 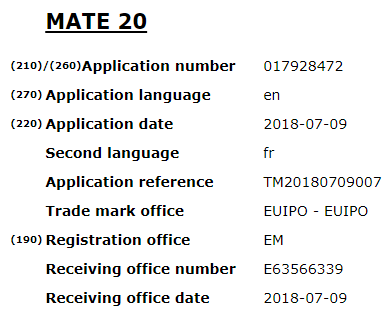 Fresh information reveals that the company has trademarked Mate 20 name with the European Union. It has been also revealed that Huawei has trademarked other monikers such as Mate 30, Mate 40, Mate 50, Mate 60, Mate 70, Mate 80 and Mate 90. Coming to the Mate 20 series, there is no information available on the specs of the upcoming Mate 20 and mate 20 Pro smartphones. The upcoming Kirin 980 chipset will be powering the Mate 20 and Mate 20 Pro smartphones. The recently launched Honor 10 GT is the first Huawei phone to feature 8 GB of RAM. Hence, the Mate 20 Pro is expected to arrive in 8 GB RAM option. The Mate 20 and 20 Pro may both feature OLED panels. The upcoming LG V40 and Galaxy S10+ are expected to arrive with dual selfie cameras and triple rear snappers. There is a possibility may rival with the upcoming LG and Samsung flagships with five cameras. The Mate 20 series may also include a lighter version called Mate 20 Lite.